Ask a new parent what they miss most about their previous baby-free lifestyle and many will say going to the movies. Leaving a newborn with another carer is probably not an option, and even when babies reach an age where they can be cared for by others, an outing at the cinema can be a costly event when factoring in babysitting fees if family help is not available. Fear not new parents, there is no need to miss that latest blockbuster movie release when your baby arrives, as Village Cinemas and Hoyts Cinemas not only allow babies into their movie theatres, but actively encourage parents and carers to bring little ones along to their fortnightly (sometimes weekly) Mums and Bubs sessions that take place at participating theatres. Mums and Bubs movie sessions are usually around 10/10.30am, midweek during school term. Lights are dimmed, and the volume set at a quieter level than your regular movie screening. 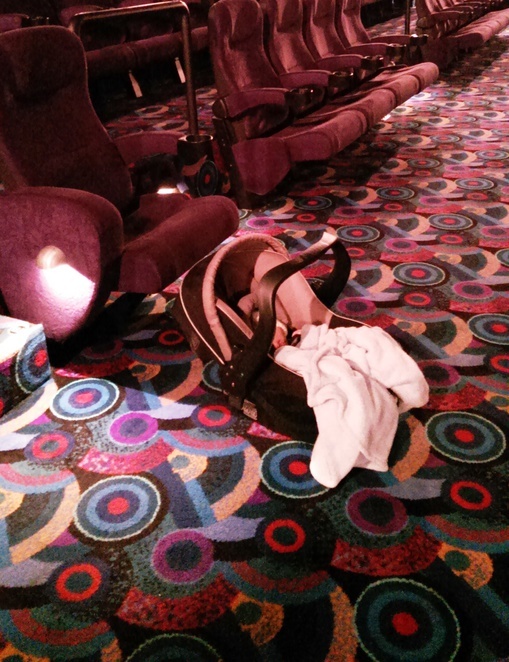 Prams are allowed (and can be in abundance), although most carers and parents hold their babies throughout the movie. And the best news of all, Mums and Bubs movie sessions are a whole lot cheaper than your regular movie ticket, at the time of writing $10 for Village Cinemas, and $9 for Hoyts Cinemas (no cost for baby). If you worry that your baby will be too loud and spoil the movie for others, don't! You might be surprised how many babies sleep through the noise of a movie, and even if your baby does cry, you'll be with an understanding crowd. I should also mention, that Mums and Bubs movie sessions are not just for Mums. Dads, Grandparents, Nannies, Aunties, Cousins, Brothers and Sisters are all welcome, the same movie ticket price applies to all. Neither cinema advertise their Mums and Bubs sessions terribly well, but they do exist. For Village Cinemas, check your nearest movie theatre's session times online here, and have a look for the pink 'BUB' sign next to the relevant movie. You can check Hoyts Cinemas Mums and Bubs sessions online here.